Early reports indicate that the "II Conventus Novae Romae North America", held over October 8th – 11th 2010 in Brunson So. Carolina was well attended and a big success. This post will be updated with reports of more cultus events shortly. A collection of photos is here and the official blog is here. 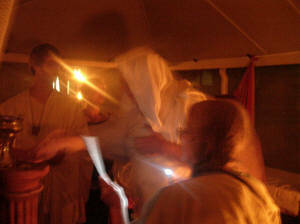 On the 4th day, M. Aquillius Rota took the toga virilis in an inspiring and moving ritual. Flamen Portunalis C. Petronius Dexter led the rite in Latin. Congratulations to M. Aquillius for completing this rite of passage, marking his entry into manhood. M. Aquillius Rota (L). Magistra et Senator Novae Romae A. Tullia Scholastica (R) assisting Sacerdos et Flamen Portunalis, Tribunus Novae Romae Petronius Dexter (Center). Not visible Sacerdos Prima A.AE et Sacerdos Veneris Genetricis, Curulis Aedilis Novae Romae L. Iulia Aquila, who said the ritual in English assisted by Sacerdos Vestalis, Questor Novae Romae C. Maria Caeca.